I’m ill in bed today with the rotten cold that seems to be sweeping through London. 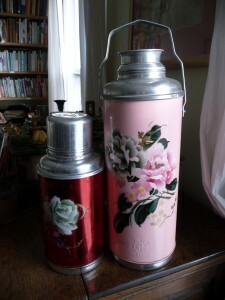 And it’s at times like these that I can’t live without my old-fashioned Chinese thermos flask. Actually I have two of them – a small one, which I use to top up a pot of Chinese tea as I work at my desk, and a large one, which is perfect not only for making Chinese tea al fresco, but also for hauling up to my bedside when I’m sick, so I can make lots of herbal tea without getting up. Apart from being useful, these thermoses make me richly nostalgic. When I first started travelling to China, they were everywhere. I would check into a room in a remote guesthouse, weary after a bone-shaking bus-ride or a long hitch on the back of a timber truck, and a fuwuyuan would immediately bring a thermos of hot water for making tea – it felt like a welcome. Sitting with friends in their Chengdu living rooms, there would always be a thermos at hand, to top up mugfuls of jasmine tea that could last for a whole afternoon. In the last few years, thermoses have gone out of fashion. Most hotel rooms are now equipped with plastic electric kettles, and many people have electrically-powered hot water dispensers at home. You only find the old-fashioned flasks, with their classic proportions and floral designs, in rural backwaters – or the occasional boutique hotel. It makes me sad, not just because of the memories they hold for me, but because they seem to me to be the perfect energy-saving device. Instead of boiling the kettle every time you want a cup of tea, or keeping it hot with non-stop electricity, you boil it once, and then, gradually, use all the water you’ve heated. Perhaps it’s time for a revival? Haha,professor Jiang told me your bolg.Your essayes are very interesting . I just did a Google search on something like ‘where to buy large Chinese thermos flask in London’ and I ended up on your site. I bought a large flask, not dissimilar to your one pictured above, in Chinatown about 10 or 15 years ago now. Unfortunately, on a recent cycling trip, I dropped my bag on the pavement and the glass inside shattered. Tea everywhere. I went into 5 or 6 grocery stores and shops in Chinatown a couple of days ago, in the hope of finding a replacement. But without any success. I am at a loss. Although I’m sure I’ll get over it. Any ideas? The funny thing is that Chinese people use those thermoses less and less, so they are hard to find. Most people now have electric kettles or those machines that dispense hot drinking water. The only places where I’ve seen those old-fashioned thermoses in England are shops selling homewares and Chinesey gifts. I haven’t seen any recently, but in the past I’ve seen them in a shop in Stoke Newington (London) selling pretty homewares, and Graham and Green in Primrose Hill. I’m sure most large cities have their equivalents, selling silk cushions, scarves, candles etc. If you have any friends going to Shanghai, you can find them in interiors stores, like the one I went to last month in Anfu Lu in the French Concession. I think I’ll try Stoke Newington first. If I have no luck there then I might try Shanghai.